Sensor input has been overhauled and improved, for laptops, notebooks, netbooks etc, with USB on COM5+ and Multi-Bell Interfaces. Also additional warnings and enhanced diagnostics showing unselected pin signals on open COM ports. 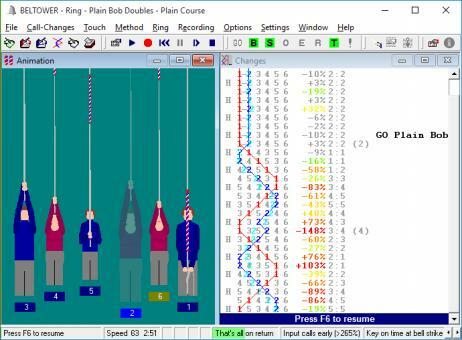 This option will leave the ringer/rope/handbell out altogether, more evenly arranging the other ringers in the available space, and better simulating your view of the ringing chamber. This can be beneficial where the animation is projected on a wall or screen, when practising on a simulator or tower bell. Here is an option which will leave a space between the tenor and the treble in the Animation window, and is designed to help you identify them more easily while ringing. Another option makes random touch calls, from a selected subset of calls and/or plain leads. You can have mostly Bobs, Singles or plain leads, fewer of some, or none at all. You can also ring random Mixed or Spliced from a selected set of methods. There is also an optional Tip of the Day which might introduce you to features which you didn't know existed or which you had forgotten about. There is an optional click to prompt you, at the moment to key-in (or mouse click) for your strike - of particular benefit with interactive animation. A button has been added on the toolbar for instant access to the Striking Monitor. The Striking Monitor now includes the number of ringer's bell strikes within each range. There are tighter ranges for experts, they can be re-initialised after your striking has settled down, and the results can be saved to file for future reference, or for use in a spread sheet. The panel is shown, in the Striking Monitor, in all modes with a single ringer's bell. The ranges shown here are for Expert ringers, within +/-25% of a strike interval. This also shows the Single Bell / All Bells / Averages combo moved here for quick access. The ranges shown below are for the rest of us, non-experts, stretched to +/-50%. The Averages mode shows the average position of the ringer's striking, and averages separately for the Early blows and Late blows, indicating the trend and the range. Combi (added with v12.32) is probably the most useful: the average of the early and late faults combined: (Abs(Early) + Late) / TotRows. The colours range from black for values within +/-10% of a strike (interstrike interval), then green, graduating through yellow and orange to red at +/-100% or more. This is designed to allow occasional reference to check for improvements, discouraging users from intensively viewing the display as with other modes, leaving them free to concentrate on listening. A more detailed summary is now available in the Recordings window and the fault for each blow is now coloured in the changes listing, as described below. The striking report summary now shows separate averages (mean) of early and late blows at hand and back strokes, in the summary at the top, for a single ringer's bell. This option, illustrated below, is an enhancement to pure perspective, showing the ringers' faces at the same level (Ok, the ladies are shorter than the men), better simulating the ringing chamber, also showing the more recent addition of female ringers and coloured striking faults.